Cold War-era FBI files on famous scientists, including Neil Armstrong, Isaac Asimov, Albert Einstein, Richard Feynman, Alfred Kinsey, and Timothy Leary. Readers learn that Isaac Asimov, at the time a professor at Boston University's School of Medicine, was a prime suspect in the hunt for a Soviet informant codenamed ROBPROF (the rationale perhaps being that he wrote about robots and was a professor). 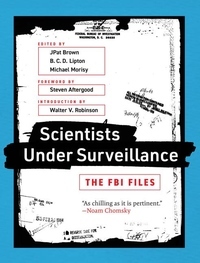 Richard Feynman had a "hefty" FBI file, some of which was based on documents agents found when going through the Soviet ambassador's trash (an invitation to a physics conference in Moscow); other documents in Feynman's file cite an informant who called him a "master of deception" (the informant may have been Feynman's ex-wife). And the Bureau's relationship with Alfred Kinsey, the author of The Kinsey Report, was mutually beneficial, with each drawing on the other's data.